When we were very young, stories helped us make sense of the world, and in many ways they laid the foundation for how we’ve interacted with information—and people—ever since. (The irresistible appeal of a good story lasts well into adulthood, as our late-night reading and binge-viewing habits demonstrate.) Whether children are the ones doing the telling or are simply listening to a parent or teacher, stories give kids the opportunity to fire up their imaginations, put themselves in other people’s shoes, and learn how to communicate. Story structures and elements like characters, plots and settings engage the developing mind in ways that help organize thinking and make connections between words and images—the fundamentals of reading and writing. Storytelling is an amazing catalyst: When children build narratives around content they have learned in class or at home, they strengthen and enhance what they have learned. They begin to make ideas their own. 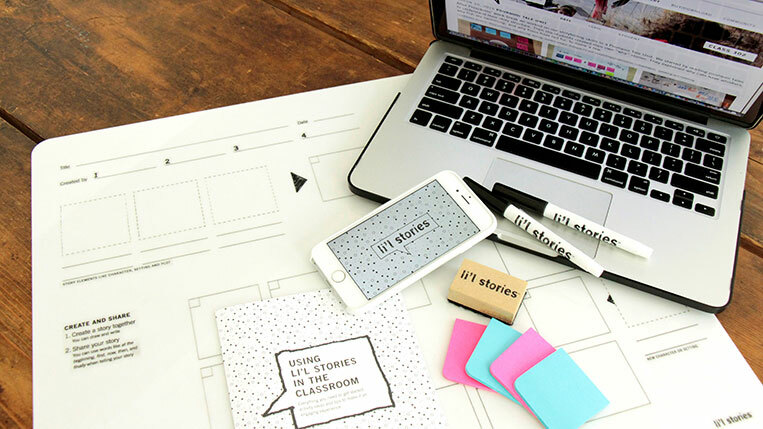 Li’l Stories framework: storyboard, app, and web site. Li’l Stories is an educational framework that helps teach first through third graders to express themselves through visual, spoken and written storytelling. 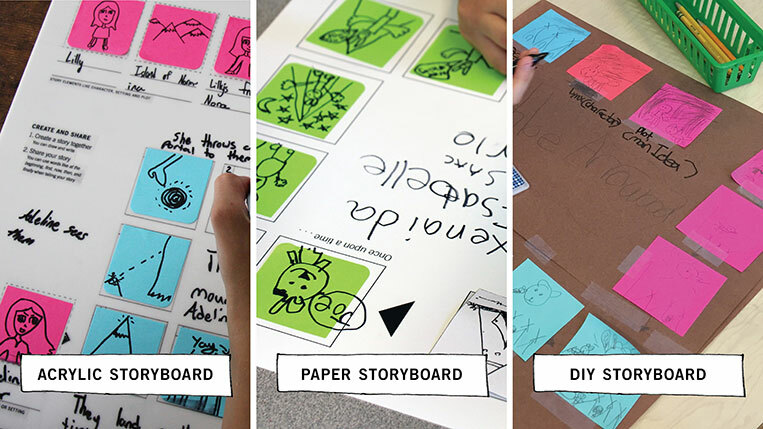 Structured as a classroom activity, the framework guides students through the collaborative creation of a visual narrative. The system supports the teaching of communication, creative thinking and problem-solving skills, as well as self-expression and confidence with others. It also establishes concepts of physical and digital production, and how the two are linked. An accompanying app and website give students the opportunity to capture their stories, so teachers can assess them and share them with parents. 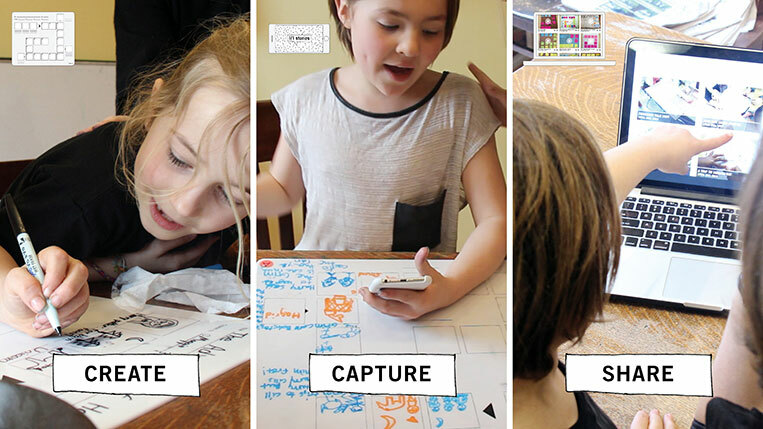 Li’l Stories framework: create a story together, capture it, and then share it. Li’l Stories was developed by Li’l Robin founder Anke Stohlmann as her thesis project at the MFA Interaction Design program of the School of Visual Arts. The work began as an investigation into learning through play. With a growing emphasis in public elementary schools on skill-based learning such as math or reading, children have limited time for play or creativity, activities that are just as important in the development of young minds. Stohlmann wanted to see if it was possible to do both at once—to teach skills like reading and writing, while also fostering play and imagination. Li’l Stories acrylic storyboard, used with Post-its. The activity is based around a storyboard that consists of a series of panels. 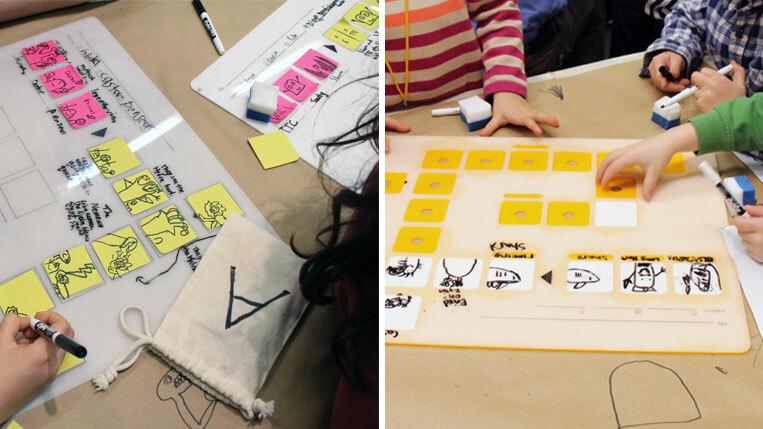 In groups of two, three, or four, students take turns drawing in the squares, extending the story panel by panel. The concept is partially inspired by “Exquisite Corpse,” the classic game where players build on previous elements to create a drawing or narrative. 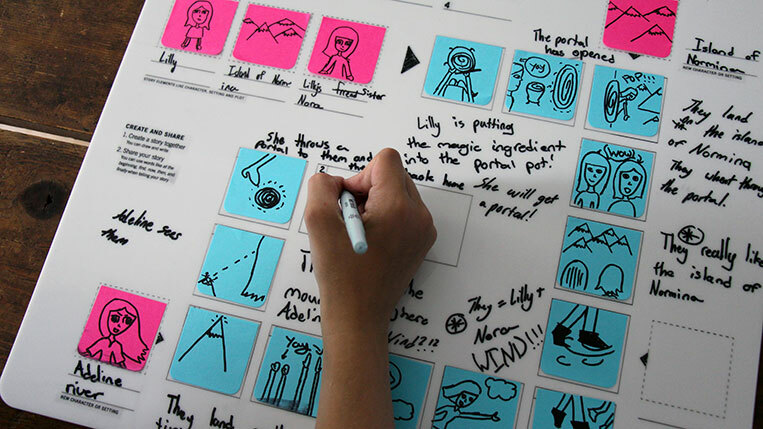 The storyboard format resembles a game board or comic strip, things most children are familiar with. Its structure helps students organize their thinking. At the end of the exercise, students can share their stories together in class, or use the Li’l Stories app to capture and upload the stories to an online classroom gallery. Li’l Stories provides an easy-to-use framework for teachers to engage and reach different learners and to support and assess educational goals. The flexible system can be applied to a variety of school programs and curriculums, and is accessible to any educator who wishes to use it. 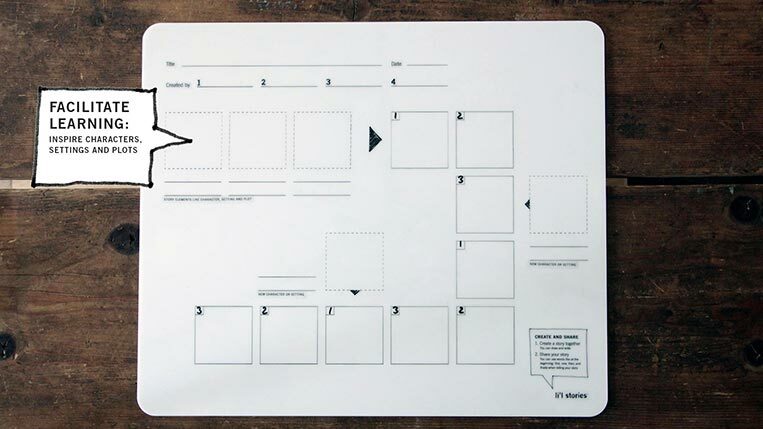 Teachers can purchase an acrylic storyboard, or download free templates to print their own board and use materials they already have in the classroom. The program utilizes children’s natural love for stories to reinforce the core ELA curriculum, teaching things like story structure, story elements, sequencing and focus. It also helps introduce new vocabulary, especially transition words that are important to the construction of sentences and paragraphs. 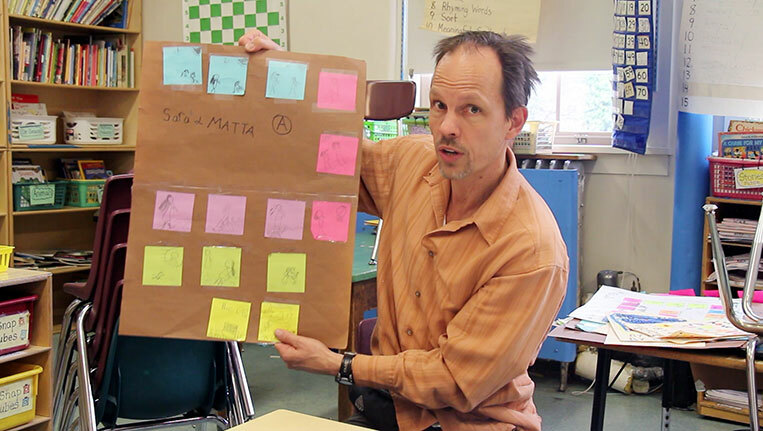 Children are encouraged to think on their feet: The board features spaces for “disruptions”—unexpected elements introduced by the teacher that students must incorporate into their stories. Click to view Li’l Stories storyboard in use. To enrich a study module, teachers can use material covered in class to inspire characters, settings and plots of stories created by students. Students can retell stories they have read or heard in class, or create new stories around specific topics or story structures like “pourquoi tales,” origin stories that are particularly engaging to children. Almost any narrative can be adapted for an exercise: fairy tales, folk stories, historical events, books and movies. 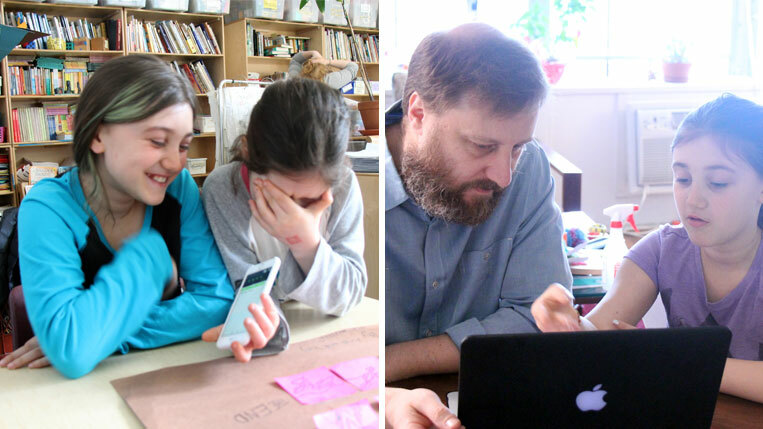 Left: Izzy and Arpi, two third graders testing the Li’l Stories app. Right: Izzy showing her dad the story she and Arpi created. 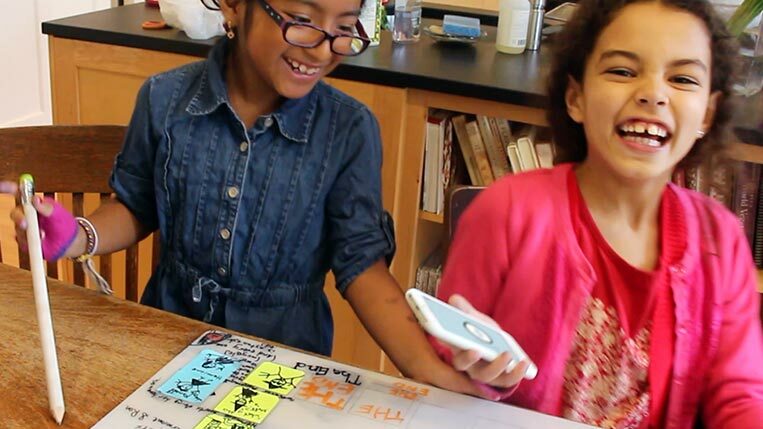 In addition to language skills, the teaching tool helps introduce young children to our connected world, where people are expected to move fluidly between creating in the physical world and capturing and sharing in the digital. Students learn how to use digital tools like the camera and microphone to document and share their work. Testing different materials during a class at the Children’s Museum of the Arts. Magnus Sweger showing a student group’s creation story. “What it really does is help children find their voice. They are working on how stories are put together,” says Magnus Sweger, a second and third grade teacher who tested a prototype of the framework in his classroom at P.S. 3 in New York. Li’l Stories pitch video, created for the Smart Pitch Challenge 2015 presented by the CUNY Institute for Virtual Enterprise. After successfully developing Li’l Stories as a prototype, we now plan to launch the framework to educators. We’re happy to announce Li’l Stories won the Project: Interaction Education Award at SVA to continue our work. We can’t wait to bring more Li’l Stories into the classroom, and look forward to sharing all the twists and turns as the project progresses.